Brandon Lambert, graduate of the Reynolds ACA at Highland Springs HS in the Class of 2017 with an Associate Degree in Business Administration, is an 18-year-old second-semester sophomore with a huge head start at Virginia Tech, having transferred 56 credits from the ACA toward his Bachelors degree in Business Management. Brandon is all smiles after his triumphant appearance. 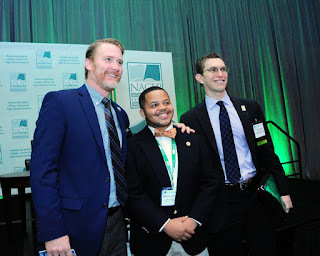 He is pictured here with his proud Site Director from the Reynolds ACA at Highland Springs HS, Allen Riddle, at left, and the Executive Director of NACEP, Adam Lowe, at right. Brandon is also nationally known in the dual enrollment community, thanks to his recent appearance in Washington, DC, at the annual convention of the National Alliance of Concurrent Enrollment Partnerships (NACEP). Brandon served on a panel with two other dual enrollment alums from Colorado and Maryland, who together addressed more than 800 attendees from all over the country last Monday morning at the conference's plenary session. NACEP Executive Director, Adam Lowe, had been so impressed by Brandon when he visited Highland Springs HS last spring that he invited him to the conference and provided funding for his travel and lodging in DC. Brandon wowed the crowd and his interviewer, Dr. Kim Hunter Reed, Executive Director of the Colorado Department of Higher Education (pictured above), with his usual eloquence and poise. Asked what he appreciated most about his four years in the Reynolds ACA at Highland Springs HS, Brandon said, "It was a gift to spend four years pursuing the same goal with seventeen other motivated, like-minded people." Dr. Reed's last question to Brandon asked him to share some final thoughts with the throng of nearly a thousand dual enrollment educators and administrators. "What you do every day makes a difference," Brandon said. "You are changing people's lives." ​Needless to say, Brandon's words elicited a standing ovation. I have always loved cooking with my mother and father since I was a child. I have been a stay at home mother since my children have been born thanks to my wonderful husband Rico being our great provider. I wanted to make a difference in my family’s life, so I decided to go to school to be an example to my children, so they will follow their passions as well. I wanted them to know that no matter how old you are, it’s never too late to go to school to get a degree. I will be the first person in my family to graduate college, so this is a big deal to me. I would love to have my own restaurant one day. I am a senior at Reynolds and taking my last and final class, which is my Capstone course. I am revisiting my weaknesses and improving on them, while maturing with my skills. We are working on menu planning, logic, flow and quality. 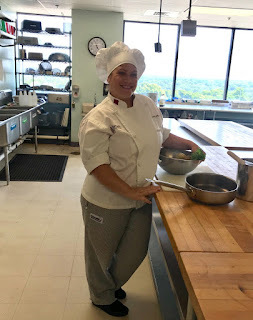 We also have to do a nutrition analysis of our menu a HACCP Analysis, food costing, and create an ingredient list for our food, setting pricing for our menu and then cook the items. We will be tested in what we have learned in Culinary French as well. Then we will take a final exam of 458 questions to test our knowledge of what we have learned in our entire culinary program. Culinary arts have brought my talent to the table. I have loved to learn to cook cuisines from all over the world. We have experienced cuisine from different cultures and learned the history behind it all. I enjoy the hands on experience in the kitchen. Cooking with fresh herbs from my garden is very important ingredient in my kitchen. They are so versatile and can add some great flavor to any dish or drink. I love smoking ribs; I am still working on perfecting my father’s recipe. He cooked the best ribs I have ever eaten. I am working on mastering my smoking and grilling techniques. I am going to jump in the culinary field and work my way up to become a great Chef and work on having a food truck. One day having a restaurant may be in my future. I love the Jefferson Hotel, they have amazing food, and it’s a great dining experience that you will never forget. They have the Lemaire, TJ’s, and Sunday Champagne Brunch. All of the menus are locally sourced and sustainable ingredients with a Southern influence of the Richmond food culture. We all will go through hardships in life, and we all will have some situations that take us by surprise. One thing I have learned in culinary that has helped me is perseverance. I kept working hard, no matter how hard it has been to achieve my degree, I am here and finally about to finish. I never gave up even when I have failed, I kept trying, and trying. You are going to have things in life that are out of your control, just don’t give up. My mother passed away on December 17, 2015, which was the most devastating thing I have ever dealt with. Then five months later her sister, my Aunt Patricia, passed away on May 22, 2016. Then my father passed on October 18, 2017. Life can be unbelievably painful, but God has the final authority in my life and yours. No matter what situation you may face in life don’t give up on your dreams. If I can do it, so can you. You can do anything if you put your mind to it. 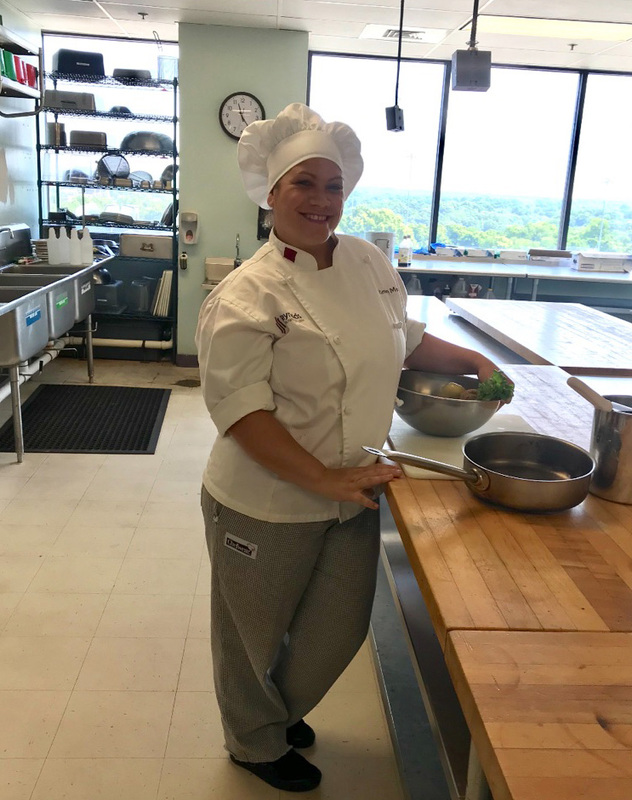 Going to Reynolds you can gain the culinary experience and all of the professional skills you need to further advance your career. You will get the education background to understand the chemistry of food, and learn the roots of recipes and the science behind it all. You will have to chance to try new cuisines, and experiment in creating dishes.You will learn how to give dishes flavor and what to pair with them that will give you the groundwork you need so you can create some culinary masterworks. Chef Miller has taught me all of this and has helped me to move forward in my culinary career. Come talk to him if you are thinking about Reynolds Culinary Arts, Pastry Arts, or Culinary Management. It is a great opportunity for someone if you have a passion for cooking. You will love to eat delicious foods and learn from different ethnic or cultural backgrounds. Growing up I always enjoyed cooking with my grandma, and she motivated me to study pastry arts. When my high school offered culinary classes I decided to try them out. I fell in love with cooking then. 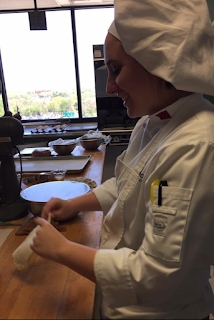 I came to Reynolds after finally realizing my dream was to become a pastry chef. In 2014 I received an Associate’s Degree in general studies from Southside Virginia Community College. Then I went to X-ray school, but that was not a fit for me. It has been a long road to get here, but I’m happy I made it. I have lived in South Hill, Virginia all my life, so it was a big change for me to drive to the city every day for class. So, there has been a lot of adjustments. 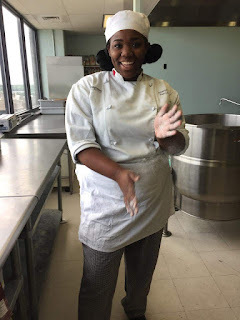 I am currently in my last semester in the pastry arts program and am working on my internship. My internship site is Red Cap Patisserie where they make French pastries. Working here had made me step out of my comfort zone into something I enjoy doing. 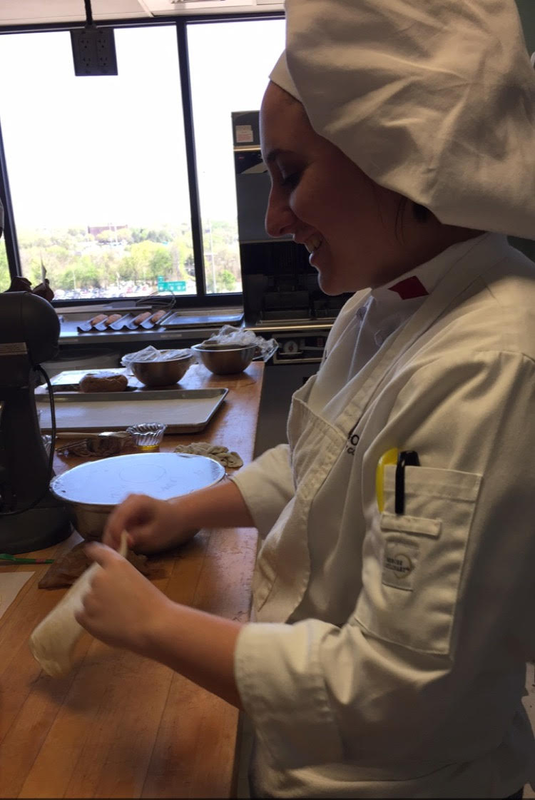 My favorite task as a student is making bread. It is amazing to me that so many types of bread come from just water flour yeast and salt. I enjoy baking because it is very calming and it is a source for creativity. My favorite ingredient is chocolate; pairs well with everything. My “signature dish” is an apple pie. Apple pie was one of the first dishes I learned to make, so ever since it has been my signature dish. There is nothing super special in the apple pie, I just always make it for all the special occasions in my family. My goal is to work in a cute little bakery, maybe one in Southside Virginia. My favorite place to eat in Richmond is En Su Boca for their tacos. I honestly do not eat in Richmond much because I live in South Hill which is an hour and a half away. But my favorite restaurant in South Hill is the Horseshoe Restaurant. I would tell people to follow their dreams and to start their culinary journey. I say that if you have a passion for baking then you should go for it! It takes hard work and determination, but it’s worth it in the end. Denise has been working for Reynolds since June 2014. But, Denise doesn't just work here, she studies here too. Diligently working and studying, Denise graduated in May earning her Associate's Degree in Paralegal Studies. When asked what motivated her to pursue her degree, she says simply, "My son is my motivation." As if working full time, studying long hours and getting a degree, and taking care of a family isn't enough, Denise has several other passions. She says, "I love to run. It is a hobby of mine as well as a way clear my head. I like to run outdoors, never on a treadmill. It is not the same! I also enjoy building and decorating doll houses, miniatures are so interesting to me because I can create a perfect little world of my own design. I write poetry and I take care of my plant babies in my spare time too." Denise believes in dreams, and has certainly worked hard to bring hers into reality. She believes in other people's dreams too and had this to say: "I would like to share with the Reynolds Community that I believe in the dream! By this I mean I believe in the product that we sell, which to me is a path to a better future by way of a quality education. I love my job and I love it because I get to, in my own small way, help others on the way to achieving their dreams." I become interested in culinary arts because of it cultural attachments, in my family food has been the way to bring us together. I also feel like culinary arts is a way of pleasing people and an expression of love. I strive to spread love and bring happiness everywhere I go. Right now, I am getting my degree in pastry arts this summer. The following summer I’ll be graduating with the culinary degree. Perfecting my bread baking skills and capstone, which is my final class before I can get my degree. There is always something new to try while cooking. Even if it’s an old technic It is always something to explore. I don’t have a specific ingredient, I enjoy different flavor combinations. No really, I believe I haven’t found my niche. 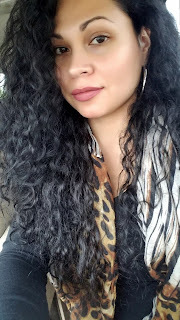 I plan to build my repertoire and portfolio, learn to run a small business, travel to learn how different cuisines and a new cultural, then ultimately own my own restaurant. Southbound is my favorite restaurant. Don’t let your fears and doubts hinder you from achieving your goals. Paula has been working for the Reynolds Department of Police for the past seven years. But, for that seven years she hasn't just been an employee, she has been a Reynolds student too, first earning a Certificate in Entrepreneurship Small Business and then her Associates Degree Management Small Business this past May. And, if that isn't enough, she has been on the Dean's List from 2011 to 2018. When asked what prompted her to get her degree, Paula said, "Cleaning has been one of my passion, so I decided to take some courses in Business, and to have my own business. My business is PG Cleaning Services (Entrepreneur) and I have been in business since 2014." Paula's favorite hobbies are singing and cleaning. "Singing is my part-time job, I do weddings, funerals, anniversaries, and birthdays. I sing with a singing group call Rev. 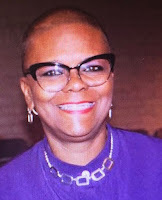 D. Kay Logan & NU Beginning Experience, and have been singing with the group for nine years, and I sing in the choir at my church, Faith Community Baptist Church." "I am a single parent, I have one son, Krystopher A. Cooper. I have one grandson who has stolen my heart, Xzavier M. Cooper who will be three years old June 15. I have two sisters, Sabrina Jones and Brice Perkins, and two brothers, Alexander, and Charles Futrell. My mother retired from J Sargeant Reynolds in 2016, my father is deceased. I love spending time with my family and friends, and going to church and movies and eating." When asked about her future, Paula says, "I am planning to attend Old Dominion University to pursue my Bachelor’s Degree in the area of Business Administration. My future plans include continuing to grow my cleaning business. Trust your Savior to pick you up, comfort you, and give you the confidence you need to continue on your journey, taking each minute, each day as it comes." “Recent Works” Exhibit by the "Reynolds Art Duo"
If you don’t like “epic” outdoor adventures with tent camping, horseback riding and hiking in the wilderness, don’t go on vacation with “The Reynolds Art Duo,” Meredith and Tony Mullins. The Mullins are artists and professors of art at Reynolds, but they are also travelers and lovers of the outdoors. 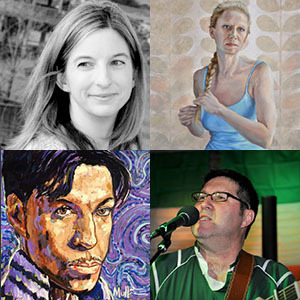 They both grew up in rural, “ruggedly beautiful” areas as Tony puts it, Meredith being raised near Shenandoah National Park outside Charlottesville, Virginia, and Tony in Rockwood, Tennessee near the Cumberland Plateau. This summer they will be taking the second part of an “epic” trip out west, driving across country to visit Mount Rushmore and Yellowstone and the Grand Tetons National Parks. Before leaving on their adventure the “Reynolds Art Duo” has an exhibit of their work opening on Thursday, July 5 in Conference Center Gallery in the Workforce Development and Conference Center on J. Sargeant Reynolds Community College’s Parham Road Campus. Their exhibit, “Recent Works” includes approximately 20 of their paintings. It will be available for viewing until Friday, August 31. Meredith Mullins says of her work, “In the evolution of [my] current paintings, the familiar female figure is studied within the contemplative moments of feminine rituals and routines. Ideas and symbols representing femininity, motherhood, childhood, growth and change appear in my work. My intent is for the figures portrayed to invoke a sense of familiarity, reminiscent of Woman, Mother, Daughter, Sister, Partner or Wife.” Meredith’s “women” are unadorned, and she most often captures them in “quiet moments of domesticity ad reflection.” She captures their essence in their natural state, before make up is applied or hair is arranged. Meredith has an incredible artistic ability to reveal the soft beauty present at that moment. Tony Mullins says, “I have spent the majority of my painting career wrestling with color, mark making and other formal elements, all while exploring the possibilities of abstract painting. With this new body of work, I’m pursuing these same themes, only now I have recognizable subject matter upon which to build paintings. I’m more interested in retaining the expressive qualities of the painting process than in capturing a perfect likeness. The faces and heads of my subjects are armatures, skeletons of an image upon which to slash, drip and expressively apply paint.” Tony’s paintings are explosions of color and recognizable faces – Johnny Cash, Willy Nelson, and Prince to name only a few. He uses unlikely combinations of bright blues, reds, and even greens to add shadows and lines to faces, bringing them alive beyond the canvas. The Mullins have been married for 19 years and have been teaching together at Reynolds for nearly 14 years. 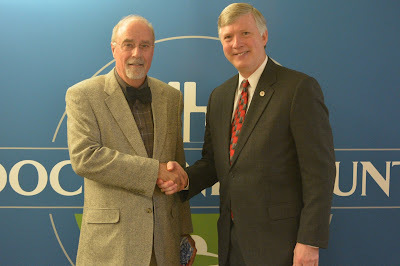 (Goochland County, June 5) The Goochland County Board of Supervisors recognized Dr. Gary L. Rhodes, President of Reynolds Community College at their June 5th Board meeting. Dr. Rhodes is retiring September 1st after serving as president for sixteen years. On behalf of Goochland County and our citizens, thank you for your leadership and service Dr. Rhodes! Dr. Rhodes is pictured here with Board Member Ken Peterson. (Richmond, Virginia – June 4, 2018) Reynolds Community College student Sophak Seng has been named an inaugural 2018 New Century Workforce Pathway Scholar and will receive a $1,250 scholarship. Only one New Century Workforce Pathway Scholar was selected from each state. More than 2,000 students were nominated from more than 1,600 college campuses across the country. Reynolds student Seng was chosen out of all the Virginia students nominated. New Century Workforce Pathway Scholars are selected based on their academic accomplishments, leadership, activities, and how they extend their intellectual talents beyond the classroom. This new scholarship is the first of its kind to support students at associate degree-granting institutions who plan to enter the workforce upon the completion of a degree or certificate on a national scale. The program is sponsored by The Coca-Cola Foundation and Phi Theta Kappa. Seng is in his third year at Reynolds. After his first year in Reynolds’ ESL program he continued his studies with the goal of earning an AAS in Medical Laboratory Technology and an AS in Science. 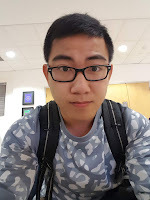 Seng credits his brother, a Reynolds graduate, with inspiring him to pursue his degree first at Reynolds and then to continue his education at Virginia Commonwealth University. Seng’s passion for the field of medical technology was also fueled by losing his mother at a young age to lung cancer and experiencing his family’s financial devastation paying for her care. “Becoming an MLT gives me an opportunity to save people’s lives,” Seng says. Getting his associates degree at Reynolds will help him save money so he can continue pursuing his ultimate goal of earning a master’s degree. Phi Theta Kappa is the premier honor society recognizing the academic achievement of college students to grow as scholars and leaders. The Society is made up of more than 3.5 million members and nearly 1,300 chapters in 10 nations. Learn more at about PTK. The Coca-Cola Foundation is the global philanthropic arm of The Coca-Cola Company. Since its inception in 1984, the Foundation has awarded more than $830 million in grants to support sustainable community initiatives around the world. For more information about The Coca-Cola Foundation, please visit the Coca-Cola Foundation.